As noted in my review of the T-55AMV kit (No. 2042) the last Soviet factory to produce the T-55, the Omsk Factory for Transport Machinery Construction, and its associated KBTM design bureau, decided to see if they could upgrade the existing T-55 and T-55A tanks to meet more modern conditions in the early 1980s. There was a need for improved protection with tanks in Afghanistan and also the Naval Infantry was not able to uses the newer and heavier T-72 and T-80 tanks with their “Aist”LCAC vehicles so they needed a better tank based on the existing ones. KBTM created the M versions - T-55M and T-55AM - which added a long list of new items. These included: a V-55U engine of 620 HP (later upgraded to the V-46-5M with 690 HP); the “Volna” fire control system with the 1K13 sight for use with the 9K116 “Bastion” through-the-bore ATGM and the KDT-2 laser rangefinder; a thermal shroud for the D-10T2S gun and a new TshSM-32PV sight; an upgraded “Tsiklon-M1" two-axis stabilizer; an R-173 VHF FM transistorized radio set and R-173P receiver set; a belly plate for increased mine protection and a driver’s seat suspended from the hull roof to protect him from mine explosions; eight “Tucha” smoke grenade launchers; side skirts; and for those tanks not yet upgraded and needing it, RMSh tracks like those used on the T-72. passive armor arrays on the glacis and turret (nicknamed “Il’ich’s Eyebrows” after Leonid Brezhnev) which came out in 1983 and a fitting of the then new “Kontakt-1" explosive reactive armor on the MV and AMV versions which followed at the end of 1984. 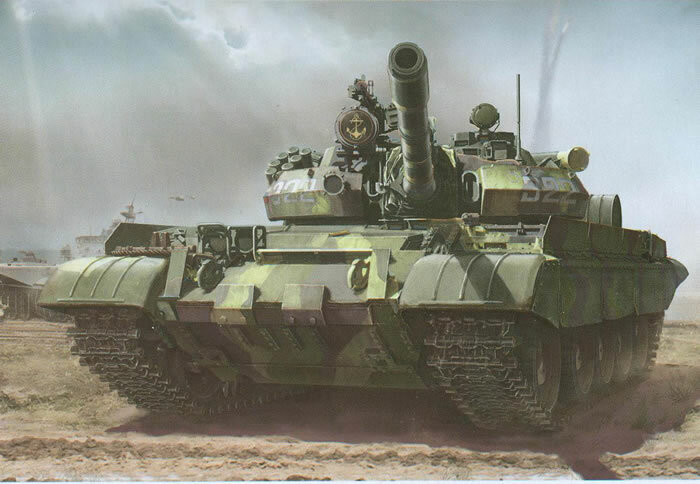 The former were also produced or converted by the Czechs and Poles as the T-55AM2 “Kladivo” and T-55AM2P respectively with some minor differences in equipment and fittings. While well over 33,000 T-55s of all models were produced, thus far there are no good numbers on the number of tanks converted by Omsk and the others. For the most part Conventional Forces in Europe declarations since 1990 have not separated out the various models (photos and data are provided but usually not separate counts). These tanks have also been sold or given to various Soviet/Russian client states such as Syria, Afghanistan, Uganda, and other African countries. Takom has now produced kits of both versions - the T-55AM and the T-55AMV - and this review looks at the AM version. Takom has produced a good base T-55 chassis and this kit has some 35 different parts to replicate the 1983 production tank. As it now obvious, these are “modular” kits that add or remove sprues to provide a specific variant of the T-54/55 family. It comes with the correct late model RMSh pre-clipped single link track links which are very nice on the face but like their OMSh brethren have two ejection pin marks on each one. However they are the “proud” type and not recessed so a few strokes with a sanding stick solves the problem. Still it is a bit tedious but for my money is still better than having to fit individual guide teeth to each link! Assembly starts with the lower suspension parts, and to their credit the rocking shock absorbers come with action arms to fit to the road wheel arms, a nice touch. It has three-piece track tensioners and nicely done idler wheels at the front of the hull. Note that something was amiss in this kit and the shock absorber assemblies are found on a supplemental sheet. Step 2/3 covers the wheels; they also use the over-exaggerated rubber molding lines on the tires which are a bit excessive. Modelers may wish to sand them down before use, especially on the running surface of the tire. A few modelers who have started work on the kits indicate that some of the tires do not fit properly so you will need to play around with them before cementing them up to see what works best. Step 5 is the hull roof; this combines the glacis necessary, the turret race, and the correct engine deck together as well as the louver details for the engine deck. Etched brass grilles are installed at this point. Note that a number of holes need to be drilled out in the glacis plate (M16) at this time. Most of the hull assembly is pretty much perfunctory assembly but in Step 8 there is a call for more holes to be drilled in the fenders as well as the stern plate. Unlike other T-54/55/62 kits up to this point Takom actually provides the fuel lines for the external fuel tanks! They form a continuous loop through all three tanks and back into the engine bay. This vehicle uses the later double bevel fuel tanks (J27) even though both they and the earlier single bevel style are included in the kit. Also note that the semi-fixed parts of the lines are molded onto the right fender so Takom did not forget them. As with most Soviet/Russian tanks, the unditching log (E5) needs some roughing up with a razor saw as it is too smooth to pass as wood. The turret has some nice touches such as a neat way to mount the PKM machine gun (H25) and a flexible vinyl mantlet cover for the main gun. It comes with a choice of either rubber fording covers for the machine gun and sight or simply their brackets. Note that there is no way to build the kit without the passive arrays on the turret without filing in a LOT of holes, so if you want a straight T-55 or T-55A I suggest you wait as Takom will most likely make on in the near future. Each of the arrays consists of five parts: three parts to assemble the armor and two brackets to mount it to the turret. Also note you have some options for the Model 1961 (no AAMG) or Model 1972 (AAMG fitted) turret fittings here. There is no pretense of a gun inside the turret and only a small device to permit its elevation is provided with the two vinyl keepers as friction snubbers to hold the gun in position. From what the directions show once assembled the gun should remain flexible. With care the searchlight assembly will snap into place and also elevate and depress with the gun if so desired. The gun barrel is a three-piece affair and the non-finned parts of the shroud are easily cleaned up with a Flex-i-File. There are four finishing options provided for this kit: Russian Marines ((Naval Infantry))(green/light green/dark green ribbon camouflage with national flag and bort number 322); Angolan Armed Forces (protective green with bort number 728 and white star markings); Cuban Army (green/light green/dark green with no markings); Russian Army (protective green with bort number 839). A small sheet of decals is provided for these markings. Overall this continues this line of really useful kits with only a few glitches here and there to annoy the purist. The tires are probably the most annoying but a few minutes with a sanding stick will eliminate most of the overwrought rubber seams molded into the tires.